The New World Order In Action: GLOBALIZATION, THE BREXIT REVOLUTION AND THE "LEFT", TAKIS FOTOPOULOS (Progressive Press, 2015). Vol.1: Globalization, the Brexit Revolution and the "Left"
Surprised by the Brexit vote in the UK, the victory of Donald Trump and the strong showing of the far-right AfD party in the German elections? Well, you won't be, if you read the extremely thought-provoking new book, The New World Order in Action, Globalisation, the Brexit Revolution and the Left by Takis Fotopoulos. The Greek left-wing political philosopher and economist argues that such phenomena are manifestations of a public backlash against what he describes as the "New World Order of neoliberal globalization" — a project driven by what he calls the "Transnational Elites," (an interconnected network of elites based mainly in the G7 countries), which seeks to destroy all economic and national sovereignty and impose a new form of low-wage servitude on mankind. In chapter one, Fotopoulos gives us a short history lesson and distinguishes between the three main phases in the development of today's capitalist global economy. There was a liberal phase in the 19th century that led to a failed attempt at globalization in the early 20th century. Then there was a "statist" phase which was universalized in the west after World War Two, in the form of social democracy and the welfare state. Then, beginning in the 1980s, came the present neoliberal phase, associated with a massive expansion of Transnational Corporations (TNCs) and deregulation of the financial services industry. The start of this period coincided, not by accident, Fotopoulos adds, with the collapse of "actually existing socialism" in the Soviet Union and eastern Europe. What happened was that the power of TNCs and monopoly finance capital became so great, that alternative economic models, based on national markets, were dismantled. This era of neoliberal globalization — ushered in by Mrs. Thatcher and Ronald Reagan — and pushed by the TNCs and banking/financial elites who funded them, has led to "an unprecedented concentration of income and wealth," so much so that by 2016 an Oxfam report showed that the net worth of the richest 62 people was equal to the combined wealth of half the world. In 2017, Oxfam revealed that just eight people owned the same wealth as half the world — 3.6 billion people. This is shocking, but no accident, as it's how the system was designed. The present era also been marked by endless wars, as the Transnational Elites target for destruction independent, resource-rich, strategically important nations which try and resist colonization, such as Yugoslavia, Iraq, Libya and Syria. These wars — routinely sold to the public as "humanitarian interventions" — in turn, have led to a huge refugee crisis, which then confuses and splits domestic opposition to neoliberal globalization. Fotopoulos is quite scathing about how the "left" in the west has either gone along with the elite, globalist project or failed to understand the "nature of the beast" that it is up against. Fotopoulos notes how many self-styled progressives regard "austerity" as being merely being a "bad" choice made by "bad" politicians, instead of it being a key feature of neoliberal globalization. He cites a 6,000 word article by Paul Krugman published in the Guardian, in 2015, in which the Nobel prize-winning American economist fails to mention the words "neoliberal" and "globalization" even once, and ignores the fact that "austerity" is also the policy of the EU and all US administrations since Reagan. It's the failure to understand that austerity policies are the inevitable consequence of "race to the bottom" neoliberal globalization — and not just the policies of a few misguided politicos, which led to fiascos such as the sell-out of the Greek people by the "anti-austerity" Syriza party. To end austerity, Syriza needed to make a clean break with the status quo — and that would have meant saying "antio sas" not only to the euro and the EU, but what Fotopolous calls "the other transnational institutions of the NWO (WTO, IMF, NATO and so on)." But as a party of the globalist, "reformist" left, Syriza did no such thing, and consequently the Greek people's agony only intensified. It's been the failure — or reluctance — of the main parties of the left to properly understand modern globalization, Fotopolous argues, that has led to the rise of the neo-nationalist right. The many victims of the current system have largely been ignored by pro-globalist parties of the left and center-left, and so populist parties of the radical right — focusing obsessively on large scale immigration-which itself is merely a symptom of neoliberal globalization and the free movement of capital — (and the Transnational Elites' wars), have moved in to fill the gap. The surge in support for UKIP in 2014-15 in Britain, which led to the Brexit referendum and the vote to leave the EU, the rise of the maverick Donald Trump, the strong showing for the AfD party in Germany- and the National Front in France, can be seen as manifestations of this. The progressive response — Fotopoulos notes — has too often been to lazily brand people voting for such parties and individuals as "racists," instead of focusing on the root cause of the growing popular discontent, which is neoliberal globalization and the economic destruction and dislocation which it has caused. Fotopoulos, like Hall et al, argues that only by opposing neoliberalism in toto and reconnecting with their traditional working-class base can the left succeed. Any attempt to improve the plight of the victims of globalization within the current TNC-friendly framework is doomed to failure. The stark conclusion from reading his book is that genuinely progressive parties in the west who want real change, need to campaign not only for their countries to leave the EU, but all the other transnational institutions of the NWO as well, as these institutions are unreformable. There are important lessons in its pages for the British Labour Party — and its leader Jeremy Corbyn, who could be on the brink of power — and who at the party's annual conference this week called for "a new model of economic management to replace the failed dogmas of neo-liberalism." Anyone who knows Corbyn, and who wishes him well, needs to send him a copy by first-class post (or by very large carrier pigeon). Evoking the anti-fascist/anti-Nazi resistance movements of World War Two, Fotopoulos' radical solution to the current crisis is for "national and social liberation fronts" to set up in countries across the world to defeat the neoliberal globalists. In the same way antiglobalists of the neonationalist right need to understand there can be no national independence without social liberation, the antiglobalists of the left need to understand too that there can be no social liberation without a restoration of full national sovereignty. The long term goal put forward by Fotopoulos in his book's closing chapter would be to move from today's grossly in-egalitarian NWO — to a democratic community of sovereign nations. This would lead to a world of genuine international solidarity, and not one where a few rich countries seek to dominate others, as is the case today. If that sounds a tall order, then it undoubtedly is. The ideology of the neoliberal globalists has become culturally hegemonic. In fact, it's hard — if not impossible — to achieve any exalted position in the arts, economics, publishing, broadcasting, or academia in the west today without subscribing to the dominant ideology. Even the previously apolitical Eurovision Song Contest has been used as a forum for pushing it — as Fotopoulos — quoting an article of mine, notes on page 63. Obsessive political correctness and the promotion of identity politics are just two of the methods used by those who benefit from neoliberal globalization, to divide and distract us. The "Russiagate" hoax — the 2017 version of the "Iraq has WMDs" scare, is another. The neoliberal globalists like to accuse others of racism, but when it comes to smearing Russia, and Russians, anything goes. The "internationalism" they promote is of course a sham as it only applies to countries which submit to the Transnational Elites' authority. Countries which don't, and try to maintain their independence, are sanctioned and threatened with war. You don't have to agree with everything Takis Fotopoulos says, and every judgement he makes in his 122,000 word book to agree with him that something urgently needs to be done to end the iniquity — and violence — of the present system. Volume Two of his New World Order in Action series is eagerly anticipated. A Review of Takis Fotopoulos. The New World Order in Action: Globalization, the Brexit and the Left. This latest blog is a review of what I consider the most important book to be published this year, by the Greek socialist Takis Fotopoulos. Broadly speaking Fotopoulos puts forward the view that TNE transnational elites are trying to set up an international structure which makes countries national sovereingty irrelevant. So that mega multinational corporations will run the world. He also explains how what he calls the fake pro globalist left help the elite globalist dictatorship plans. For instance Y Varoufakis Diem25 plans for a 'democratic, EU which Varoufakis knows himself cannot work. Fotopoulos explains how the USA was behind the plans for a united Europe just after the second world war so as to help the fight against communism. The CIA role in setting up the European unity movement has been well documented. At first this took a slow pace with the founding of the European Economic Community of just six countries in 1956 which at first was just a trading bloc. However with the arrival of the neo liberal period from the 1980's onwards and the collapse of actual existing socialism in the period 1989 to 1991 the TNE plans for a transnational corporate dictatorship really took off. In 1992 the Maastricht treaty created a single European Union market. This has been further developed with the arrival of the Euro currency which ends countries national economic sovereignty and democracy. From 2000 the author explains most countries economic rules are in fact decided by globalist dictatorial institutions like the WTO, IMF and the World bank. This involves compulsory privatization and labour market deregulation. Fotopoulos show how in 2009 Transnational corporations controlled 2/3rds of the world trade. He also quotes Josef Stiglitz who states that the bottom 90% of the American populations income has remained stagnate for the last three decades so globalization does not favour the working masses. He also shows how TTIP will make countries national sovereignty irrelevant, thank god it now seems likely that TTIP will be defeated. The author explains how TNE use violence against countries which do not fall into line with their plans. For instance Syria, Iraq and Libya and also try to threaten countries like Russia, China and Iran. Importantly he exposes the role of fake pro globalist left groups like Syriza and Podemos in supporting the elite globalist plans. For instance the outrageous Syriza government sell out to the EU in 2015 and its programme of mass privatization since. Fotopoulos shows how the DIEM25 plans for a 'democratic EU is a utopian plan which cannot be achieved. Any so called united Europe would be a neo liberal dictatorship controlled by the TNE. Turning to Brexit the author correctly explains how this was a major working class revolt against globalization. However he also shows how the fake pro globalist British left overwhelmingly was against Brexit. Even Corbyn who used to be anti EU mysteriously switched sides to support the remain campaign. Can we really trust this man? Fotopoulos shows how in Europe the left wing political parties are general decline. Due to their being exposed for supporting neo liberalism, privatization and loss of national sovereignty to the EU etc. In the last part of the book the author explains how we can defeat the transnational elite. He calls for the formation of Front of Nationals and Social Liberation FNSL in every country in the world. These fronts would break with the TNE by building from below. By breaking with the TNE and the new world order they would build a new economic model based on self reliance and the public of ownership of the major part of the economy. Countries under the control of the FNSL would leave globalist organizations like the EU, WTO, IMF and the World bank. They would also establish their own national currencies. In conclusion I would urge everybody to BUY this very important book either from Progressive Publishing Co in San Diego or else amazon. Finally thanks must be given to Joseph P Leonard of Progressive Co for publishing this book. 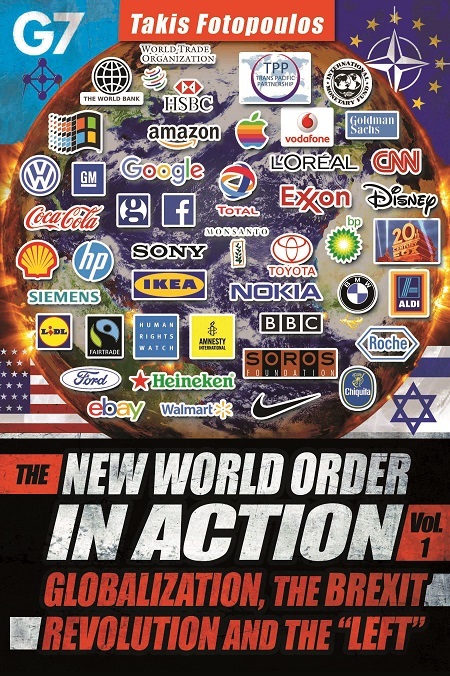 One book that does show us a way out is ‘New World Order in Action’ by the Greek political philosopher and economist Takis Fotopoulos, which I reviewed here. Fotopoulos explains how austerity policies, which have greatly increased inequalities, are not merely a ‘bad’ choice made by ‘bad’ politicians but in fact a key feature of neoliberal globalization. Austerity is insisted on by the powerful global financial and corporate economic elites who call all the shots. Fotopoulos calls for the formation of ‘national and social liberation fronts’ to make a clean front with neoliberal globalization and its institutions. It’s doubtful he got an invite to Davos. But in what sense is Le Pen and the FN fascistic? Particulary, since the term has become increasingly redundant. In policy terms, she seems to be a leading part of the anti-systemic revolt against globalization. All well and good if this is taken at face value. Moreover, there seems little imperialist element in her programme, unlike, Macron, the globalist neo-con who many of the left saw fit to vote for to stop Le Pen. Le Pen’s FN is not an aggressive movement directed at other nations and peoples living beyond its borders but essentially a defensive movement fighting for the right of any nation for self-determination which is under attack by the globalist elites who control political-economic unions like the EU. Talking of Nazis, it should be borne in mind that the neo-cons – the military wing of the globalization project – have nurtured and protected their own brand of bona fide fascism in Ukraine and the Baltics. Unfortunately, the centre-left no longer uses this sort of rhetoric – or indeed practise – and instead covertly, and sometimes even openly, supports the globalist agenda, with occasional reservations of course. What is usually trotted out is the well-worn ‘there is no alternative’ (TINA) argument which is assumed to be unanswerable. Change the EU from the inside! Don’t overthrow the Bourbons, reform them! This in fact is the response of the collaborationist. He has among his well-heeled supporters those other capital-friendly ‘centrists,’ like Tony Blair protégé David Miliband and the UK’s extremely wealthy ex-Chancellor George Osborne, both of whom tweeted their congratulations following the election result. Macron is the poster boy not only of the French elites but what Takis Fotopoulos, author of The New World Order in Action, has called the ‘transnational elites’ too.